This is a story of greed, corruption, and the struggle for religious freedom. The story begins in one of history’s gloomiest times, the Dark Ages. It was one of the most turbulent times in human history, but also one of the most inventive and creative. Although the Dark Ages were a time of struggle and strife for the common person, it was also around this time that Leonardo da Vinci completed the Mona Lisa, and Michelangelo was at work on the Sistine Chapel; two of the greatest works of art known to humankind. I guess you could say it was the best of times; it was the worst of times. During the Dark Ages, the Roman Catholic Church was in charge of much of life as people knew it back then. Doctrines like John Calvin’s theory of predestination, which stated that all men are not created equal and it was preordained who was going to Heaven and who was going to Hell was one the church used to rule the people. The times were such that anyone who disagreed with the ruling class or the church could lose their head or be burned at the stake. Nevertheless, the seeds of religious unrest were taking root and growing stronger by the day. The abuses of the church had become well known among the people and they were not happy with what they had come to see as it’s Medieval and pagan practices and demands. It had become greedy and was making the people pay for many things, even the baptism of their children. Church officials then used the money to enrich themselves and build on to their already massive churches. All of this corruption and greed left the poor even poorer. The church said that anyone who didn’t pay for these “indulgences” was not going to get into Heaven. Greed and the love of money had clearly corrupted the church. The people may have been poor, but they weren’t stupid; they knew instinctively that no man can decide who goes to Heaven or Hell. They were quickly becoming tired of kowtowing to every whim of the church and its self-indulgent priests and the all-knowing Pope. Tension among the masses continued to grow. Along came a man by the name of Martin Luther, he was a member of the Roman Catholic Church but he was on the side of the people. He too had grown tired of the abuses and he posed this fundamental question: “Why should the Pope be in charge of all things moral?” Martin Luther questioned many things about the Roman Catholic Church of the Dark Ages. He then put his questions and concerns in writing, and he called it the “95 Theses.” He took these theses and nailed it to the church door. It was a brazen act that earned him the charge of heresy and excommunication from the church. In another bold act, he simply began distributing his document throughout Europe; it spread like wildfire, resonating through several European countries. The changes that came about as a result of Luther’s “95 Theses” became known as the Protestant Reformation. The Reformation was a huge event in the history of humankind because it was just the catalyst needed for church reform. Because of it, many different kinds of churches began to be formed. Among them were the Reformed and Protestant churches. These new churches had as their goal to return to the basic principles of the Bible, which they felt the Roman Catholic Church had seriously strayed from. One of the first and foremost groups formed from this new movement became known as the Anabaptist movement. Their main belief centered on baptism. They believed only willing adults should be baptized, not infants, as was done in the Roman Catholic Church. Infants, the Anabaptists believed, didn’t know right from wrong and baptizing them of them made no sense. They also demanded no government interference in their church, no tithing or money lending and no requirement for military service. All of these ideas went against the Roman Catholic Church of the day, but the people persevered and practiced their faith as they saw fit. They were persecuted for their faith and decided to pack up and come to America where they could practice their religion their way. When they arrived here they eventually settled in Pennsylvania. Jakob Ammann was a devout follower of the Anabaptists but soon decided to separate himself from them and start his own church. Those who followed Jakob Ammann came to be known as the Amish. They too settled in Pennsylvania, in a town that came to be known as Lancaster, PA. The country’s largest group of Amish still live there today. They live there and have continued their lifestyle and held to their beliefs. 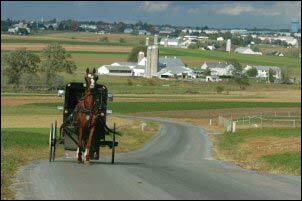 Known as one of the “plain” communities, the Amish shun most of what are known as worldly things, like cars, telephones, and electricity. Their emphasis in life is on family and community. The Amish do grow most of their own food, but they also shop at local stores for staples such as flour and sugar. They homeschool their children up until the eighth grade; children then quit school to help on the family farm and learn the trade of, among other things, furniture making. This is one of the arts the Amish have become best known for. However, among many Amish, tradesmen techniques have become progressively more modern. Today, the Amish have become widely known for their finely crafted furniture. They craft this wood into solid furniture that can last a lifetime. In their furniture making they use only American grown hardwoods like oak, hickory, maple, elm, and cherry harvested from sustainably managed forests. While their furniture is usually well-made of sturdy hardwoods, the Amish don’t seem to have a distinct style of their own. Their designs echo the style of Shaker, Mission, and Early American furniture. It seems everywhere you look Amish furniture is being sold. The idea is that, just because it’s made by people who live largely outside the modern system, who travel to and fro mostly in horse and buggy and grow some of their own food, that their furniture is somehow better. In many cases, this is simply not true. The Amish have been exploited, and so has their way of life. Yes, their main mode of travel is horse and buggy, but many of them also hire local “taxis” to take them places. It’s one way people in the local area make extra money. Many in Amish communities also use telephones to conduct business in their woodworking shops. Knowing all of this, I had to ask myself what is Amish furniture, really? Isn’t it just furniture made by Amish people? The answer is yes and no. Their designs and methods of construction used to be completely done by hand. Today their furniture is still practical and for the most part well made, but not made entirely by hand. Today, many Amish no longer use the time-honored construction methods of mortise and tenon joinery and dovetailed corners. Much of their furniture can be found to be made with particle board, composite materials and held together with wood glue and screws. There are even some modern woodworking shops that will hire Amish workers just to satisfy the fair trade laws of their state and be able to claim their furniture is Amish made. I believe this is one of the ways the Amish culture has been exploited. The Amish are a people that, for the most part, live a simple life. They live without many of the modern conveniences that most of us enjoy and feel we couldn’t live without. They aren’t tied to the main electrical grid, but that doesn’t mean they live entirely without electricity. Instead, many of them use diesel generators in the making of furniture. A diesel generator makes its own electricity and requires diesel fuel to run. A generator can power all sorts of machines and tools such as hydraulic pumps and compressed air for use in the making of furniture. Car and solar batteries are also used. The Amish use modern technology on a case by case basis, according to how they feel its use will affect their community. So the myth of an Amish person toiling away at furniture making with nothing but hand tools is just not true across the board. Working with hand tools is much more eco-friendly, but I don’t believe the amount of furniture sold as Amish can all be done completely by hand. Completely handcrafted furniture would go for a much higher price than what most “Amish” furniture stores are asking. 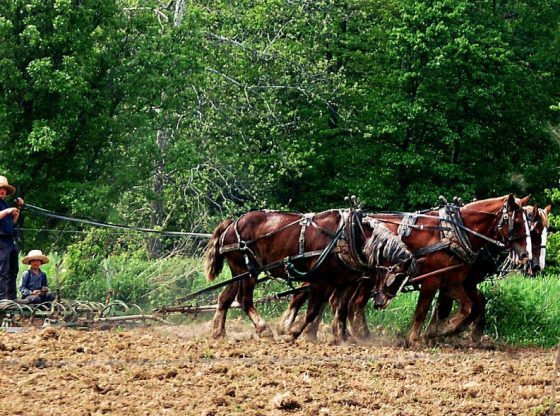 Amish Myth #2: A Green Process? The diesel generators that many Amish use require diesel fuel, which is easier to refine than gasoline, but its refining process requires more crude oil per gallon. Diesel engines, if under a heavy load, can belch out smoke into the atmosphere just like the big diesel trucks we see on the highways. Diesel engines can also be very noisy and their emissions have been found to be very toxic to humans as well. Taking all of this into consideration, many Amish woodworking shops are pretty similar to other woodworking shops across the country. I have to question whether the Amish furniture making process is really as green as we are led to believe. We’re expected to believe that their furniture-making process is completely sustainable just because they’re Amish, but is it really? Amish Myth #3: Heirloom Quality Furniture? I believe most Amish put their heart and soul into the craft of furniture making, and their beliefs are reflected in their simple furniture designs, but they don’t completely shut out the modern world in the process. Many still use the mortise and tenon joinery technique, a woodworking process that dates back thousands of years. The mortise is a cavity cut into a piece of wood and the tenon is the piece or notch that fits into the cavity. This joint can then be sealed with glue, a wooden pin, dowel or bolt, adding additional strength to the piece. But more and more Amish are using modern tools and making their furniture the quick and easy way with veneers, inlays, and wood of lesser quality. Some of the furniture stores that sell Amish furniture are simply trading on the back-to-the-land and environmental awareness movements. The use of the word Amish is supposed to conjure up the image of a diligent Amish person hard at work using only chisels, jackplanes, and crosscut saws to turn out heirloom furniture that will last a lifetime and is worthy of passing down for many generations to come. But I believe you should carefully inspect any furniture that claims to be Amish made and evaluate it as you would any other piece of furniture. Amish Myth #4: Amish Furniture Style? Amish furniture falls right in line with Shaker and Mission furniture styles in its simplicity and lack of embellishments. Ornamentation of any kind is seen as sinful. And while Amish furniture definitely mirrors their uncomplicated lifestyle; the furniture itself isn’t all that unique. The Amish do take care in matching the type of wood to the particular piece of furniture they’re making, but Amish furniture isn’t a style unto itself; it echoes Shaker and Mission furniture. And unless you’ve studied them, and know what you’re looking for, you will be misled. Each one does have its own unique characteristics but as a whole, they’re so similar that they tend to be lumped into the same style group, even though each of them arrived at different times on the historical timeline. All of these styles are mostly durable, functional, and well made. The Shakers made their furniture, with round wooden knobs and wooden handles, tapered legs, and subtle curves. Most pieces were made using dovetailing and pegs as joining techniques. Graduated drawers were also one of their design elements. Dresser drawers were made in graduated style, having the bottom drawer the largest in order to store heavier items, with drawers becoming smaller and narrower as they reached the top. Mission style furniture is also made in a rustic, simple style, very similar to Amish furniture. It’s built for durability, strength, and beauty, just as most Amish furniture is, but like Amish furniture, it’s not much different from what you’ll find in the big box stores. But furniture stores have gone bonkers over what they want you to believe is handmade Amish furniture. In many cases, this furniture is of about the same quality as most other furniture on the market. Furniture sellers have taken a few basic truths about Amish life and expanded on them; creating what I think can be called the Amish furniture myth. I don’t think this does the Amish people any favors, and may well have made their lives more difficult since they’re the kind of people that shun the spotlight to begin with. In many ways, the Amish are just like you and me, but the Amish myth-mill that our society has created is just plain silly. The Amish came to America in order to practice their faith and live their lives as they saw fit, and for the most part, they’ve done that. But the myth that has been perpetuated about them is wrong and misleading. So if you’re in the market for furniture, evaluate any Amish furniture you might come across as you would any other piece of furniture, and be careful not to buy into the Amish myth.